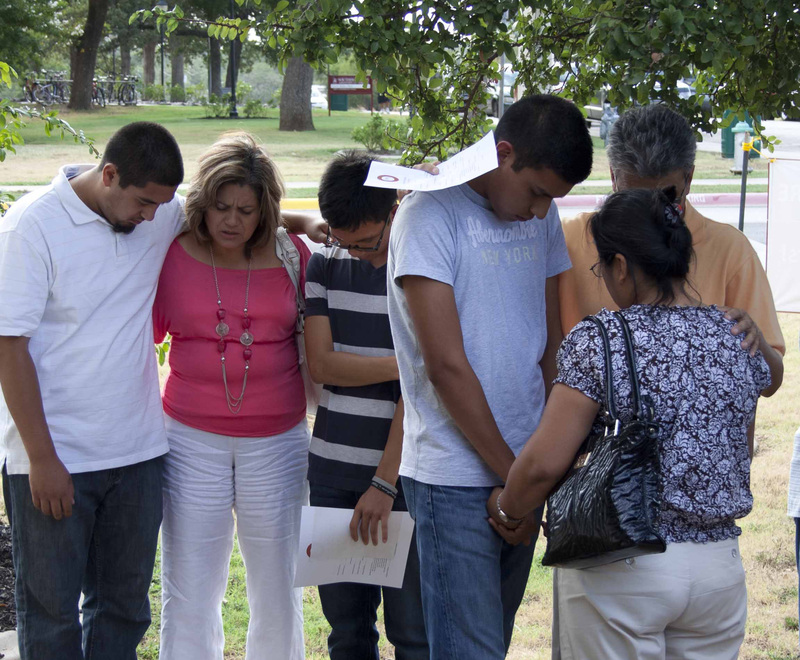 Parents pray with and for their freshmen on the front lawn of the Hopps Museum. Southwestern Adventist University’s Class of 2016 was officially welcomed onto the university campus on Wednesday, Aug. 15 when Southwestern held its traditional Mizpah Ceremony. This is the second year this commitment event has been conducted. The event, which began in the sanctuary of the Keene Seventh-day Adventist Church, started with prayer, and music provided by Rudyard Dennis, Marc Elysee and Ana Scarone of the Music Department. University President Eric Anderson then addressed the students and their parents, asking “How Did They Do That?” He cautioned against people who look for shortcuts in education, calling it “karaoke education.” This was followed by remarks from Amy Rosenthal, the University’s new vice president for academic administration. who introduced students and parents to the CORE concept, the idea that education at Southwestern includes development of Character, capitalization on Opportunity, assumption of Responsibility and preparation for Eternity. Three speakers–one representing the parents, a second the students, and a third the University–read homilies specifically prepared for the event, calling for each to assume responsibility and accept promises by the others. After the presentations, everyone exited the sanctuary and walked to the front lawn of the Hopps Museum, where parents were invited to have prayer for and with their students. Students then crossed the street and filed beneath the Mizpah gate and shook hands with faculty and staff, who waited to welcome them to their new school. A dinner for students and their parents, faculty and staff followed in the Leiske-Pultar Auditorium.